Using a geometric approach shown to me by Mike Meier at WW I have approximated the CG of my basic trainer glider design. There will be more error in my calculations because my sail is not cut in the straight line at the TE. To be more accurate I would have to come up with the straight line equivalent of the area back there.Mike showed me how to find the Mean Aerodynamic Chord and then set the CG at 25% of that chord line. This should get me into the "ballpark" for the initial tests so that the CG is not way off to begin with. I'm getting close to building the 1/5 scale flying model. I see you have increased the truncated portion compared to the initial drawing sent to me via email Frank. As a matter of observation, I also see the truncated portion, the leading edge, and the crossbar all share a common junction point. Also, the crossbar is drawn straight across. I have two questions so far. 2. How are you planning to join the crossbar, leading edge, and truncated portion? I can imagine a regular type junction for the L.E. and crossbar but with the junction plate extended on the truncation side to provide a "pivoting point" for the truncation....so all three tubes are actually joined by a single plate? 3. If the crossbar is going to be floating, and the truncated portion is also going to be foldable, I see a fairly short package if this is the case. If the truncations could fold to lie parallel with the L.E. the disassembled glider will not be much longer than the keel itself....and only 40 pounds? The shape is almost identical to one of my favorite paper airplane designs. I was actually pretty surprised as Frank suggested smaller diameter tubes like we used to use cable braced via deflexors and Mike didn't flinch an inch....Mike said, "sure, why not"? I remember the tests done on the wills wing SST....they hung six pilots from that cable braced glider made from 1 1/2" by .049 tubing and the glider never broke even though the leading edges were horribly deformed....that old glider was super light and strong as a bull. Although no design of any aircraft can be totally idiot proof.....this design is going to come awfully close. Thanks for your comments, Jim. I think I mentioned somewhere that the cross spar would be floating and foldable but maybe it was just in my head. I was thinking I could buy the ball and socket joint from WW and modify it if it didn't fit the tubing I use. As far as folding goes I just have a general idea floating around in my head. The truncated tips would have the diagonal braces removed and then folded inward along the LE's. I'm hoping that with a "noseplate" type of junction at the place where the tips, cross spar, & LE come together I can get a configuration where all of those can fold together. This is something I can physically model to try different things if I can't work it out in AutoCAD. The "fly in the ointment" will be how much room the sail requires as it bunches up against the tubing as it is folded. For holding the upward twist in the tips I'm counting on cable from the king post. The short span will give me a greater angle of the support cables which will help and I may also have to go with a fairly tall king post. I'll probably need cable to the tip ends from the base tube also. That diagonal brace from the tip centers to the LE's is going to be a very important component that the support cables work with. 1) Test the flight performance in a 1/5 scale model. Make any changes needed from results there. 2) Decide on tubing sizes and cable bracing methods, where used. At this point I will need to evaluate the tubing size/weights for "complexity vs benefit". It may be that with the short span that 1-1/2" x .049 6061 cable braced may not be much of an advantage over 2" x .032 7075 not cable braced. BobK suggested this evaluation. Although I have an inclination to trust more the structural integrity of the cable braced approach. 3) Design detailed junctions of folding components and other hardware components. Probably going to be some physical full scale modeling done here. Next will be the construction of the full scale airframe and getting battens made by WW. At this point it won't be complete with control bar or king post. Just a lay on the floor airframe. Now beg, conjol, plead, with Steve at WW to make me a sail for it. Actually before the battens ar made I hope to get some input from him on the exact cut of the trailing edge curves for distribution of loading and airflow without flapping edges. I envision the sail tension along the LE's to be a grommet with a line extending out to the corners with the tips to pull tension outward. The ends of the tips could be done the way it is done on current glider wingtips. Jim, I may follow your lead and offer to buy a block of time from Wills Wing for getting more input from Steve. If they would sell me several hours for an "advice and sail design details conversation" it would be money well spent. Remember at this point I have the basic airframe done and I will have my batten curves design approximated. If I weren't closer to the Atlantic than to the Pacific then I might offer to help in the development. Not sure what the plan is, to attach the truncated tips to the main wing spars. In the true spirit of HG "R & D" (as in, Rip-off & Duplicate), I would suggest using bent joiner tubes (rather than any heavy bolted structure), similar to what was used on the ASG-21 Albatross. Those joiner tubes were bolted to the leading edge, but I re-made mine with three equally spaced Stainless Steel 0.25" blind rivets (instead of bolts), to save weight. Together with other crafty hardware mods there, I removed (IIRC) about 60% of the tip assembly weight on the ASG-21, and I was able to demonstrate to Tom Price that my Albatross had about the same 45/45/45 roll rate as a WW Raven. He said if he had not seen it, he would not have believed that. Now I recall that the ASG-21 joiner tubes were bent rather sharply, with some minor kinking in the middle of the bend. I believe we can make those bends better today, using a slightly larger radius, and bending the joiner tubes before applying the T-6 tempering process. Thanks for the suggestion Red. I was also thinking of using the "joiner tube" method you suggest but since I will be fabricating this glider in my shop, using the machine tools I have, I was going with bolted plates because it would be easy for me to fab those fixtures. However, I definitely agree that bent tubes would be better from a weight standpoint and avoid sharp places where someone bumping into the tips would get cut. However, the use of plates and bolts also facilitates my folding of the tip tubes in along the LE after removing the diag brace tubes. Additionally, if I want to adjust the horiz tip angle slightly greater or lesser than 120*, to change the tip sail tension, I can do that by changing the length of the diag braces when using plates instead of a fixed bent tube. 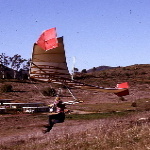 If someone were to put this "one off" experimental glider into production, then the joiner tubes could be the way to go, as you suggest. Frank Colver wrote: Thanks for the suggestion Red. Weight at the wingtips can mean the difference between light handling, and a truck, in turns. 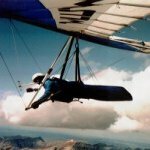 I did nothing but reduce weight in my Albatross tips, and as I said, even the glider designer was shocked by the obvious difference it made. Everybody had assumed that the ASG-21 was hard to roll due to the sail design, but the real problem was a high tip weight (or mass). Inertia counts, out there. I believe that a good tube bender (like a guy who builds car exhaust systems) can bend up pairs of joiner tubes for you, cheaper and faster than fabricating heavy tip plates. You can have him bend six or eight tubes with various angles (in pairs) for a quick switch of the tip geometries. With my ASG-21, I simply covered the gap between the trunk tube and sail with ripstop Nylon tip covers, similar to the originals but lightweight, and very easy to tailor to fit. Once you know what you really want for tip angles, you can tailor the sail main body to enclose the trunk tube with the sail, much like the old Rogallo sails enclosed their leading edges. For the sail anchor at the rear end of the trunk tube, I used a simple loop of Purlon that passed around (over) the tube end and seated into a small plastic "hook" plate that was blind-riveted to the outside of the trunk tube. It weighed less, entirely, than just the original Rapide-Link on the original Albatross tip connection. Standard glider design criteria: Simplicate and add Lightness. 1. the lighter the weight near the tips, the lower the mass that must stop moving in one direction to reverse direction....less weight near tips always results in a quicker roll. 2. I bent 6061-T6 1 1/8" by .058 with a 3 1/2" radius die with poor results....switched to a die with a 4 1/2" radius and had beautiful results....so, yes, radius is key for bending alloys such as 6061 and even though bends "harden up" the bends are still plenty strong. I know at least one HG manufacture who bends all his own base tubes in this manner with good results....but, as RED Says....for full strength the tubes should be shipped to the bender on dry ice at zero....bent....then shipped back on dry ice to be heat treated to 6061-T6....that is the BEST way and the ONLY way if a sharper radius is the goal. But Franks design (In the above drawing) is going to require the standard crossbar/L.E. connecting "plate" regardless and if that is also the point of truncation...well....might as well use the same plate....however...a pre-bent tube as RED suggests would allow more freedom in design and could be attached via PiP pin removed for folding. P.S. the "dry ice" method is to prevent aging of the tubes when time is involved between steps in the process. Aluminum naturally hardens even over short periods of time....when I bend "fresh" 6061 using 4 1/2" radius I can bend up to 180 degrees with excellent results......When I tried to experiment with "old" tubing from my buddies hang glider "boneyard"....I experienced kinks and/or failure with relatively small, 45 degree bends. Aging of tubes makes a big difference. reluctantsparrow wrote: Aluminum naturally hardens even over short periods of time....when I bend "fresh" 6061 using 4 1/2" radius I can bend up to 180 degrees with excellent results......When I tried to experiment with "old" tubing from my buddies hang glider "boneyard"....I experienced kinks and/or failure with relatively small, 45 degree bends. Aging of tubes makes a big difference. Frank, et al . . .
Once bent, the aluminum can be tempered again, back to the original T-6 standard. I believe it would be best to delay the anodizing process until last, when the joiner tubes are already bent and re-tempered. Local anodizing shops may have problems with very long pieces, but the short joiner tubes should not cost much to anodize locally. A good college or university can probably fill in the exact details on the metallurgy processes, here. They are usually happy to supply such information for manufacturing, but it may be wise to avoid mentioning the finished product.